The Group Checkout feature allows teams to checkout as a group, with the application aggregating all checklist data and allowing the customer to sign off just once. The feature is designed for scenarios where multiple technicians are working on multiple assignments, simulatenously or sequentially, for the same customer that share a Service Call ID. Workforce Management Service Calls and activities are managed in the Workforce Management app. Business Partner The “Business Partner” is the customer for whom the activities are occuring. Contact The “Contact” is the person with whom the technician/s communicate. The contact may also be the person who signs off on the multiple activities during checkout. Technician The “Person” is the technician associated with a given activity. Non-Leader on Site technicians will be able to complete activity and select the Mark Single Assignment Ready for Checkout option. When all assignments are completed, the Leader on Site will then be able to initiate the group checkout. Leader on Site The “Leader on Site” is the technician responsible for the Group Checkout. The Leader on Site is self-selected from the mobile application. When the Leader on Site selects the Checkout for Multiple Assignments option, checklist data from interrelated activities completed by other technicians will be aggregated for a single checkout. Open The activity is open and checklist and effort data can still be entered by the technician. Locked The activity has been marked as completed and effort data (such as work time, material, and mileage) can be used in the final checkout. When the activity assignment is locked, changes can no longer be made. Closed The Group Checkout has been completed, and the effort data has been reviwed and approved. Mark Single Assignment Ready for Checkout This is the option non-Leader on Site technicians will use when they have completed their assignments. When all assignments are completed, the Leader on Site technician can then select the Checkout for Multiple Assignments option. Checkout for Multiple Assignments This is the option the Leader on Site will select when all assignments related to the Service Call have been completed and are ready to be checkout out. 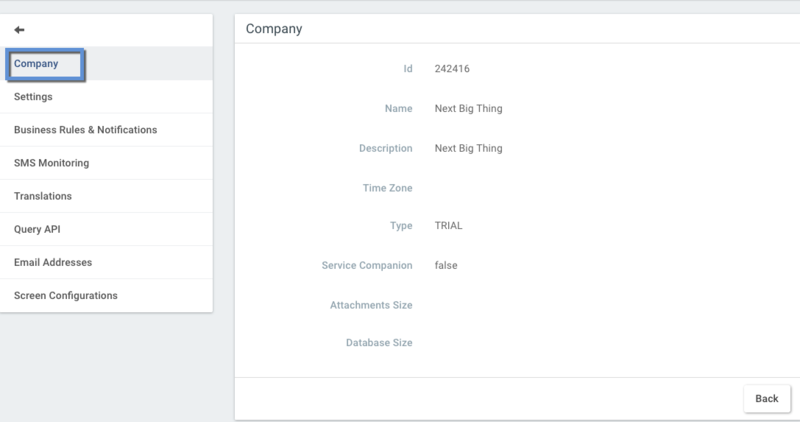 By selecting this option, data from individual assignments will be aggregated into a single checkout instance, allowing the customer to view basic assignment details and technician effort details, and sign-off for all assignments at once. When Service Checkout permission settings have been configured, the fields necessary for Group Checkout will display in the mobile application. Search for and select the cloud user for whom you would like to assign Group Checkout permissions. Select the Service Checkout business object. Select the "Show Advanced" option. Check the Display type "Checkout for multiple assignments" (Group Checkout) checkbox. Check one of the Display type "Mark single assignment ready for checkout" options. Note:The Display Type "Mark single assignment ready for checkout" (without creating a report). option means that a report will not be generated for the individual technician's assignment when the assignment has been marked ready for checkout. Definitely Close Assignment By selecting this option completed Group Checkout assingments will be closed and can no longer be edited after marking as “Ready for Checkout”. Checkout for Mutliple Assignments By selecting this option, the Leader on Site will be able to complete the Group Checkout of all assignments related to the Service Call. Mark Single Assignment Ready for Checkout (without report) By selecting this option, non-Leader on Site technicians can complete their assignments and prepare the assignment for use in the Group Checkout. By selecting this option, the application will NOT generate a report for individual assignments completed by non-Leader on Site technicians. Mark Single Assignment Ready for Checkout By selecting this option, the default option for non-Leader on Site technicians will be set to Mark Single Assignment as Ready for Checkout. When the option is selected, the information will then be aggregated for use in the Group Checkout. When the Leader on Site setting is enabled in the Admin Module, technicians will be able to mark completed assignments as “Ready for Checkout”, and the technician designated the “Leader on Site” will then be able to complete the checkout. CoreSystemsIsMerge LeaderOnSite TRUE to allow changing only the Leader on Site without conflict resolution but instead merging this change only to the existing Assignment. This means the cloud will not report a conflict in case the LeaderOnSite was the only attribute which had been changed. FALSE or setting not defined to handle changes of the Leader on Site with standard conflict resolver like any other property. Option to allow changing only the Leader on Site without conflict resolution but instead merging this change only to the existing Assignment. This helps to allow changing the leader on site any time without risking a conflict with other changes by other client applications or connectors. CoreSystems ResourcePlanner IsLeaderOnSiteEnabled TRUE Checkbox to enable the Leader on Site Feature in Workforce Management. 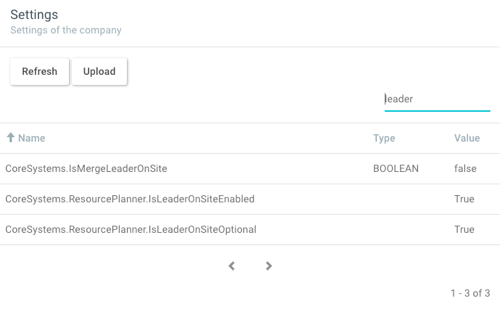 CoreSystems ResourcePlanner IsLeaderOnSiteOptional TRUE Checkbox to enable that the Leader on Site is not mandatory on each Assignment (only possible if TRUE). Search for an select the company settings listed above. Set the values of the company settings listed above to TRUE. Multi-technician service calls can be created in either the Project Management app or directly from the Workforce Management app. When released, the technicians will then be able to select who will act as Leader on Site. All checkout and effort data from all technician activities will be aggregated onto this technician's device, allowing for a single checkout. When all assignments have been completed, the Leader on Site will select the Checkout for Multiple Assignments option. Key checklist and effort data will then be aggregated, and a single checkout instance will take place on the Leader on Site's device. Following the Group Checkout, effort records entered by technicians such as time, material, mileage, and expenses will then be reviwed and approved in the Time & Material Journal tab of the Workforce Management screen. This information is often used for invoicing purposes. Multi-technician service calls can be created in either the Project Management app or directly from the Workforce Management app. Multi-technician service calls will share a Service Call ID. When released, the technicians will then be able to select who will act as Leader on Site. When non-Leader on Site technicians complete their assignments they will select the Mark Assignment as Ready for Checkout option. When all assignments have been completed the Leader on Site will select the Checkout for Multiple Assignments option. Key checklist and effort data will then be aggregated, and a single checkout instance will take place on the Leader on Site’s device. Following the Group Checkout, a service report can be generated that contains the details of the activities and group checkout. This is generated on the mobile device in PDF format in offline mode, and can then be signed by the customer. The completed Service Checkout will then be synchronized to the cloud on the next sync activity, upon which a PDF copy of the signature and a service summary can be emailed to the customer as an invoice is prepared. This report can also be generated from the Service Calls tab of the Workforce Management app using the Preview Report feature. Note: Please note that if the CoreSystems.ResourcePlanner.IsLeaderOnSiteOptional setting is set to TRUE, the customer signature may be optional. After the checkout has been completed, efforts such as time, material, mileage, etc are approved in the Time & Material Journal tab of the Workforce Management app. Efforts related to a Group Checkout will share a Service Call ID. This ID can be used to filter and view effort records related to the Group Checkout. Following approval of Group Checkout efforts, an invoice can then be prepared and sent to the customer.